"When you spot an opportunity you need to make a decision fast. It is in your moments of decision that your destiny is shaped." You get a call from a new client who lives out of town but wants to buy a home staging consultation with you for their parents who live in your city. Learn what color combinations create calm or drama and excitement. Learn how to change a room from rustic to romantic, or from traditional to dynamic. Over 150 color combinations and practical information. You get a call from a potential client or a real estate agent. They want to see your portfolio, but you don't have a web site yet. Do you meet them for free to show it to them? This is very time consuming and can look unprofessional. Or, you get that all-important media coverage but you can't leverage it because readers (potential clients) have no way to find you on the Internet? Or, have you already registered your own domain and when people go there, they see "under construction" or "domain is parked?" Again, not a great image for your new business! I've created the Staging Diva Directory of Home Stagers to give you an EASY way to have an Internet presence RIGHT AWAY. Not to mention how being part of StagingDiva.com will boost your credibility. If you don't have a domain name, or a web site and never intend to have your own, The Staging Diva Directory is a perfect way to showcase your talents with next to no effort on your part! If you have your own domain name and have not yet built your site, you can easily have your domain "point" to your page on the Staging Diva site. Visitors end up directly at your web page on stagingdiva.com without ever seeing that your site is not yet built. If you already have a web site, you can use your listing in the Staging Diva Directory of Home Stagers, to send more traffic to your own site. This house sold for $71,000 over asking. The client invested about $900 in my advice during a home staging consultation. Do you think he got his money's worth? 1. Consider all the time you don’t get paid for. For example, preparing for a client appointment, answering potential clients' questions in advance, scheduling and re-scheduling appointments, travel time, follow up calls (before, during and after the project), keeping track of client expenses and time on each project, bookkeeping, standing in line at the bank, etc. If you think $100 or even $250 per hour is too much to charge a client, remember the many hours you put into your business that no one pays for. 2. Consider what tangible benefit you bring to your home staging clients. Do you believe you provide real value to your clients? If you don’t believe this, it will be very difficult to convince them. It might help to think about how much financial value you can bring to a client if you do the job well. Don't fall into the trap of feeling embarrassed about your rates. Done well, a home staging project should generate anywhere from $10,000 to $50,000 profit for the homeowner. So, why shouldn't a professional home stager be paid well? 3. Remember that when you're in a service business you are selling your time. You have limited "inventory" so make sure you're not always "on sale!" Since you can't manufacture more hours in a week, the only way to earn more is to charge more for your time. The Staging Diva course “The Business of Home Staging: What you need to start and how to grow” includes a detailed discussion of pricing strategy. If you've already taken it, now is a great time to review your notes so you make sure you earn what you're worth this spring real estate season. If you haven't taken this course, you can order a recording of it right now for only $179. You'll make that back easily on your first client because I share with you everything I've learned about pricing based on my MBA training and the real world experience of being an independent entrepreneur since 1989. I have also built a lucrative home staging business from scratch in a very competitive market. In Staging Diva course 2, you'll learn what I charged clients three years ago and how I systematically increased my rates over time. I'll share the single biggest discovery I made in how to best price home staging services for profit. You'll also learn what home stagers charge all over North America and how not to make the same mistakes they are! I'm serious when I say my mission is to inspire and empower others to build a home staging career if that's what will fulfill their dreams. So, I'm especially thrilled when students and graduates write to me of their triumphs. Starting a new business isn't easy and they've accomplished great things. Congratulations to Dianna Leeder and Mary-Anne Stevenson on the launch of 2 Visions Home Staging. 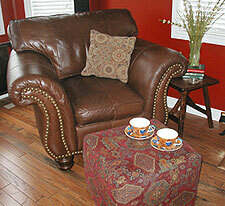 You can check out these designing sisters in The Staging Diva Directory of Home Stagers. Did you know I offer a $200 discount on the second registration from the same company? Congratulations to Jenny Olsen-Kennedy of Urban Lane Designs who took what she learned in The Staging Diva Home Staging Training Program and landed herself a paid (!) weekly column on home staging in her local paper, The Red Deer Advocate! Now that's a quick way to get known as the local expert without spending any money! Congratulations to Derrian Smith who splashed on the scene by launching her company Dressed to Sell with an event in a local gallery and a booth at the Atlantic Home Show. She got newspaper coverage, a CBC radio interview and many leads! In course 4 we talked about how many times a prospect has to hear about you before they buy. Derrian is well on her way! Congratulations to Bernadette Broderick of Décoration Première Impression, Carolyn Carter of Done in A Day, and Queena Murdock of Q Interiors. All three recent graduates took what they learned in course 4, "Staging Diva's Sales & Marketing Secrets" and went out and got feature articles on their home staging projects in local newspapers and magazines! Linda Schleihauf, of The Detailed Home turned an agent referral into a string of 5 home staging projects and a project from her listing in the Directory of Home Stagers, into a home staging project worth 20 billable hours! There's no stopping Linda who understands what it takes to build a business and manages to fit projects in around parenting and another job. Staging Diva Students and Graduates, send me your successes so we can help you celebrate your triumphs and inspire others to follow your example! The Staging Diva Network launched Feb 1. This OnLine Discussion Group for Graduates of The Staging Diva Training Program is a great source for ongoing information and support. You'll find discussions on where to get rental furniture and paint kits, the pros and cons of an S Corporation versus LLC, challenges faced on first projects, cheap marketing tricks for when you're starting out, and more. All you need is Internet access and email to participate in this supportive community of fellow home stagers, nothing high tech about it! In February I told you about my stories in CNNMoney, Entrepreneur Magazine, Fort Wayne Journal Gazette and The Wall Street Journal. You can still check them out at the media page. I've got features coming up in March and April in Center of The City Magazine (which included a photo shoot on a staging project), The Globe & Mail, Home & Decor (which has a 6 page spread on my staging projects), Chez Toit, and Style at Home Magazine (which will feature my design book recommendations in June). Traffic to your profile in The Staging Diva Directory of Home Stagers increases exponentially without you having to do a thing to get this added exposure. And, you don't pay anything extra either! With every media appearance, I get calls from people looking for a home stager in their market. Just this week, I've referred projects to Staging Diva Graduates in California, Florida, Kansas City, Brampton and Richmond Hill.